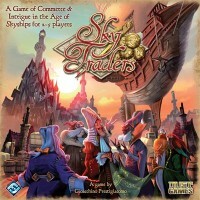 Be sure to download the Sky Traders player’s scrrens from the Fantasy Flight website. These screens can be used to hide your money (guild piasters). It can make a difference as a few 50 or 100 piaster coins visible in your purse can motivate your competitors to work against you. After all, a wise merchant would not be flaunting his cash in the marketplace.